Palletforce is a logistics company based in the UK and with operations across Europe through its partnership with Allnet. The award-winning company transports a range of goods for businesses in diverse sectors, including manufacturers and retailers. The Alliance Computer Network is Palletforce’s customised I.T. system that monitors a pallet’s lifecycle from collection to delivery. Palletforce customers are able to review and track orders online using the system. The Alliance Computer Network also provides Palletforce’s member companies with a tool to analyse pallet volumes and performance using the system’s information management functions. The system also includes a delivery address tool to verify address information using the latest data from the Royal Mail. In order to track a pallet, a Palletforce Tracking Number, Consignment Number or Customer Reference is required. To track a shipment, visit www.palletforce.com. 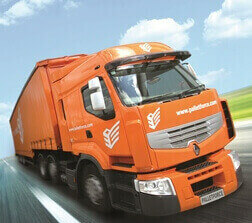 Palletforce is made up of 87 member companies that are also independent transport companies. Each member company has an equity share in Palletforce, meaning it is owned by its members. The company’s distribution network includes more than 100 depots across the United Kingdom and Europe. Palletforce’s flagship state-of-the-art distribution hub is located in Burton-upon-Trent in the Midlands of England, close to the A38. The company’s hub is one of the largest centres of its kind in Europe with 400,000 square feet. Palletforce uses a shared delivery network to maximise efficiency and move freight quickly. 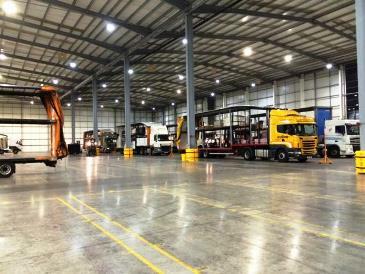 The company’s central hub in Burton-upon-Trent allows member companies to work together when transporting freight. Each member company delivers their goods to the hub, which is strategically located close to the centre of the UK. Once their goods are delivered ‘half way’, member companies pick up goods from other hauliers before returning to their base depot. This prevents transport companies from delivering loads in one part of the country and returning to their base with an empty lorry. According to Palletforce, 85 per cent of the company’s network trucks operate full. By comparison, the company estimates that traditional fleets run at approximately 50 per cent full. Palletforce delivers small and large consignments 24 hours a day throughout the year. With strategically located depots across the United Kingdom and partner depots throughout Europe, Palletforce offers timely and reliable deliveries with a high-tech distribution network. The company has been awarded several honours in recent years, including being recognised as the ‘Pallet Network of the Year’ by the Institute of Transport Management. Palletforce has also been recognised by International Freighting Weekly and the Chartered Institute of Logistics and Transport (CILT). The company also won the Royal Society for the Prevention of Accidents (RoSPA) Gold Award in 2014 for the fifth consecutive year. Palletforce handles consignments of any size, including delivery of a single pallet and larger loads with multiple items. In addition to standard services within the United Kingdom, Palletforce also provides bespoke services such as warehousing and order picking, European and international deliveries, same-day express delivery, and other customised services. The company also provides daily collections. Within the UK mainland, Palletforce offers Next Day Delivery by the end of business day as its standard express service. The company also provides Next Day Delivery by 10:00 a.m. or mid-day, as well as other timed delivery services. An economy service is also available for less urgent consignments. Palletforce also offers Saturday Delivery and tail lift services. In Northern Ireland, Next Day Delivery, an economy service and tail lift services are provided for consignments of all sizes. Next Day Delivery is only available to Dublin, while delivery times to other destinations in Ireland and to the UK’s other Offshore Islands will depend on the size of the shipment and the distance travelled. Economy and tail lift services are also available for deliveries in Ireland and the UK’s other Offshore Islands. To obtain a quote, call Palletforce on 08450 944441 or complete the online enquiries form. Alternatively, contact a member depot directly for more information about current prices. Palletforce is a member of Allnet, the Alliance of Networks. Allnet is a partnership of leading pallet transport and freight networks in Europe, forming a ‘super network’ for transporting palletised freight within the continent. All consignments sent to destinations within Europe are handled by Allnet partners. In addition to Palletforce, Allnet partners include Astre Palet System (France), One Express (Italy) and ONLINE Systemlogistik (Germany). According to Allnet, the network distributes approximately nine million pallet loads of freight annually across Europe or about 36,000 pallets every day. The network covers 42 countries and includes 18 central hubs, more than 300 delivery centres and approximately 17,000 vehicles. All shipments transported through the Allnet network are fully traceable online. Warehouse and fulfilment services are also available with other Allnet partners. For more information about Allnet and its partner networks, visit www.allneteurope.com. Palletforce has more than 100 depots throughout the United Kingdom and Europe. To make the search process really easy, PalletForce offers the a Palletforce depot online finder for the UK or Europe. A phone line is avialable at 08450 944441 as well for those, who prefer to call to find out the details. Each of Palletforce’s member depots is a shareholder, meaning each member of the company has an equity share in the business. As a member depot, members can use the company’s £30 million purpose-built hub and are linked to Palletforce’s state-of-the-art I.T. system and management monitoring facilities. Members also have access to marketing and sales support to promote their business. For more information about membership opportunities. 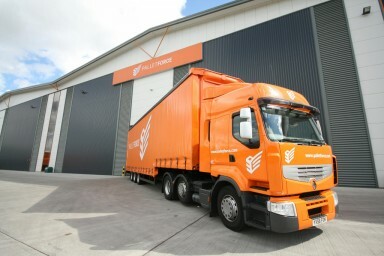 Palletforce and its member companies employ more than 4,500 people across the United Kingdom and Europe, including approximately 100 people at the company’s hub in Burton-upon-Trent. There are a range of career opportunities with Palletforce, including with the company’s I.T., sales and accounts departments. All current vacancies with Palletforce can be found on their careers website. Palletforce’s registered address is Palletforce PLC, Callister Way, Centrum West, Burton-upon-Trent, Staffordshire, DE14 2SY. To contact the company by phone, call 08450 944441 or +44 (0) 1283 539 392. Alternatively, email Palletforce by completing the company’s online enquiries form. Information is also available by contacting a local Palletforce depot directly.